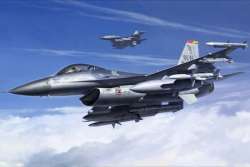 A new variant of the F-16C Fighting Falcon from Tamiya. Unique points such as the smaller air intake, engine nozzle, and landing gear are all included. Wide selection of weapons including GBU-12 Paveway II laser-guided bombs and LITENING II targeting pod. 3 types of colourful U.S. Air National Guard markings.